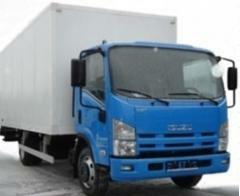 ISUZU NLR - 85L 2015 g the cm3 engine ISUZU 4JJ1 Euro-4, Obyem 2 999, 5 FUR, the full weight of 3500 kg, the equipped mass of the chassis of 1850 kg of / p.1650., independent spring suspension bracket. The conditioner, the central lock, elektrosteklopodyemnik, elektro-mirrors with heating, the hydraulic booster, a wheel with the regulated corner, a motor brake, ABS,ASR,EBD, tires R16., Japanese quality. 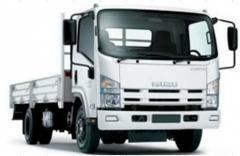 New cars we custom-make installation of the hinged equipment of the client: bodies: board, board awning (door portal, top loading), tow truck, dump truck. Vans: manufactured goods, isothermal, the refrigerator, production material, a configuration of the hinged equipment at the request of the client. We install refrigerating appliances of TERMOLIFE, THERMAL MASTER, ALEX ORIGINAL, ZANOTTI, GARRIER, automobile heaters new and second-hand, hydroboards, cranes manipulators, we carry out individual orders. 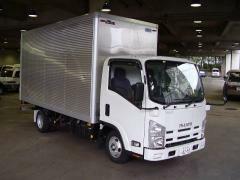 The dealer offers new ISUZU trucks. Credit, Leasing, Service. 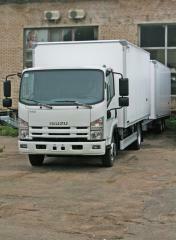 Unbelievable price on ISUZU NLR-85 truck in Cherkassy (Ukraine) company Predpriyatie "FORSAZh".